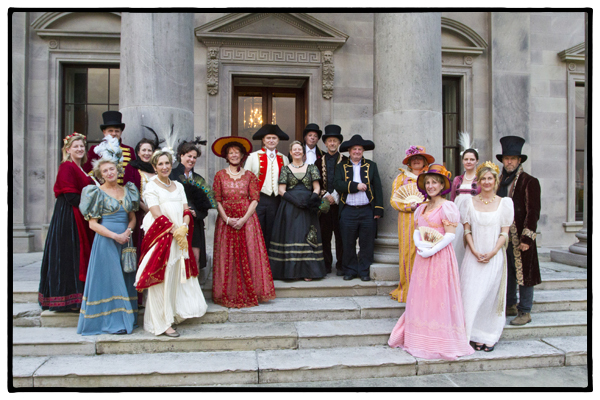 The guests at Ballyfin dressed up in their operatic costumes before dinner. Photos by David Lansing. It all started when Jim Reynolds, Ballyfin’s majordomo, made an off-hand remark about how the owners, Fred and Kay Krehbiel, bought the entire collection of old period costumes from the Lyric Opera of Chicago (where Fred is a trustee) and brought them to Ballyfin. Well, this was interesting. 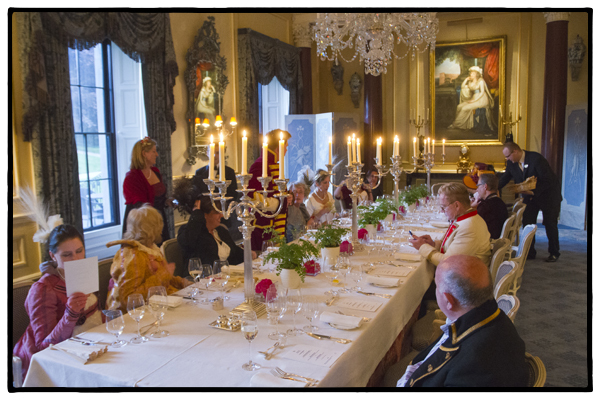 Guests dressed up in opera costumes for dinner? Next thing you know we’re all being shuttled over to the staff quarters and escorted upstairs where there are two large rooms with dozens and dozens of opera costumes, some of which look Victorian, others Napoleonic and still others sort of Gatsbyish. Obviously we had to give it a go. 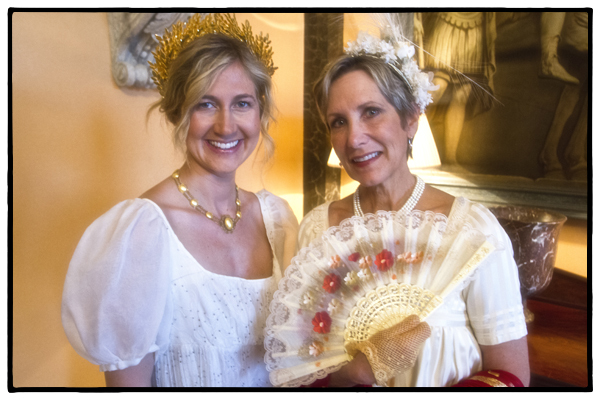 Casey and Jan looked like extras in a Merchant-Ivory movie. Photo by David Lansing. I pick my costume out in minutes: a long elegant coat with elaborate gold trim, a red silk vest , and a black satin top hat (which probably didn’t really go with the jacket but I liked it anyway). “We shall have to start calling you Sir David,” said Reynolds. I felt the same way. So the two of us high-tailed it back to the manor house and quickly ordered up a bottle of Redbreast and a couple of glasses. An hour or so later, the rest of the group joined us. What a transformation. Not just in the way everyone looked, which was extraordinary, but in the way everyone acted. The costumes clearly changed everyone’s personality. Including mine—I was now Sir David Lansing, Premier Baronet of Ireland. Which meant I could order as many single still pot Irish whiskies as I wanted. Which I did. The guests at Ballyfin at dinner. Photo by David Lansing.